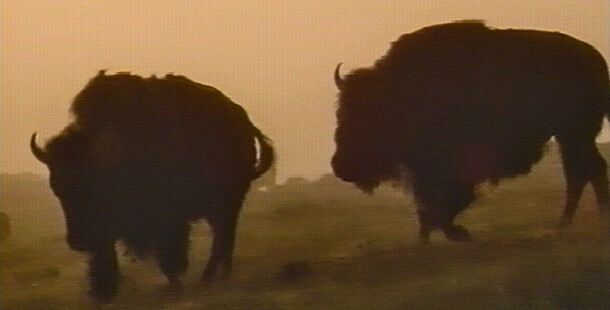 Buffalo were the lords of the prairie. To European settlers traveling across America’s Great Plains in the early 1800s, the prairie wind was a constant companion: a gentle whisper echoing across the vast sea of grass that carpeted the center of the North American continent. Sometimes, however, the rumbling of thunder could be heard in the distance, though no storm clouds could be seen. Then the ground would begin to tremble, and suddenly the astonished newcomers would be surrounded by a thundering herd of hulking animals that stretched further than the eye could see. The majestic welcoming committee made it clear that the settlers had, at last, arrived in the buffalo nation — a land where tens of million of American Bison held sway. The NATURE program American Buffalo: Spirit of a Nation tells the sad story of how the buffalo nation was destroyed nearly a century ago by greed and uncontrolled hunting — and how a few visionaries are working today to rebuild the once-great bison herds. It offers a remarkable portrait of America’s last significant wild bison herd, made up of a few thousand animals living within Montana’s Yellowstone National Park. And it highlights the efforts of Native American leaders dedicated to bringing back the animal that once gave life to their tribes. “Buffalo have to be there for our culture to exist,” says Fred DuBray, a member of the Cheyenne River Sioux tribe who appears in American Buffalo. “As we bring our herds back to health, we will also bring our people back to health.” Like people, the buffalo — known to scientists as Bison bison — came to North America long ago from Asia, crossing a land bridge that once connected Siberia to Alaska. The early bison were enormous lumbering animals, weighing up to 5,000 pounds and sporting horns that spanned more than six feet across. Bison can weigh up to a ton. Over time, however, the North American stock evolved into trimmer beasts. Still, modern bison can weigh up to 2,000 pounds; they can be more than a dozen feet long and stand up to six feet tall at their massive shoulder hump, which serves as a storehouse for energy-rich fat. By the time America’s earliest peoples had established villages about 20,000 years ago, the bison dominated the rolling grasslands and forested hillsides that stretched west from the Mississippi River west to the Rocky Mountains. Researchers estimate that prairie bison alone numbered between 30 million and 200 million, while a woodland variant existed in smaller numbers. Though killing such large, fast animals was a formidable task — bison can run for long periods at up to 35 miles per hour — ancient tribes soon perfected several effective techniques. Some would surround small herds with a human chain, giving archers a better shot at the tightly packed animals. Others learned to stampede bison over cliffs. Such “buffalo jumps” provided tribes with critical supplies of nutritious meat and warm hides that allowed them to survive the region’s harsh winters. But flesh and skin weren’t the only prizes: tribes learned to use virtually every part of the animal, from horns to tail hairs. “The Indian was frugal in the midst of plenty,” says Luther Standing Bear, a member of the Lakota tribe. “When the buffalo roamed the plains in multitudes, he slaughtered only what he could eat and these he used to the hair and bones.” Indeed, for thousands of years the huge bison herds were able to accommodate the loss of the relatively few animals taken by Native Americans. In the 1500s, however, things began to change. First, Spanish explorers introduced horses to the region. By the 1800s, Native Americans had learned to use the speedy steeds to chase bison, dramatically expanding their hunting range and effectiveness. Next, guns made their way into the hands of buffalo hunters, making them increasingly deadly hunters. But it was that arrival of vast waves of white settlers in the 1800s — and their conflict with the Native American residents of the prairies — that spelled the end for the buffalo. Among the earliest waves of settlers were trappers and traders, people who made their living selling meat and hides. By the 1870s, they were shipping hundreds of thousands of buffalo hides eastward each year: more than 1.5 million were packed aboard trains and wagons in the winter of 1872-73 alone. The commercial killers, however, weren’t the only ones shooting bison. Train companies offered tourists the chance to shoot buffalo from the windows of their coaches, pausing only when they ran out of ammunition or the gun’s barrel became too hot. By 1880, the slaughter was almost over. Where millions of buffalo once roamed, only a few thousand animals remained. Soon, their numbers dwindled, with the largest wild herd — just a few hundred animals — sheltered in the isolated valleys of the newly created Yellowstone National Park. As American Buffalo shows, it is from this tattered remnant that people are today trying to rebuild the once mighty buffalo nation. wNetStation is a production of Thirteen/WNET New York's Kravis Multimedia Education Center in New York City. Ann Willmott Andersson, Director of Interactive & Broadband. A Co-Production of Partridge Films and Thirteen/WNET New York. Funding for the TV series NATURE is made possible in part by Park Foundation. Major corporate support is provided by Canon U.S.A., Inc., Ford Motor Company, and TIAA-CREF. Additional support is provided by the nation's public television stations. To order a copy of AMERICAN BUFFALO: SPIRIT OF A NATION, please visit the NATURE Shop. 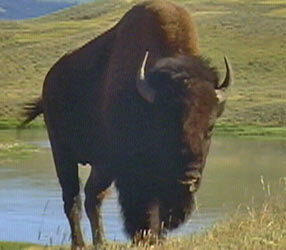 Online content for AMERICAN BUFFALO: SPIRIT OF A NATION was originally posted November 1998.